Following a Bring and Share lunch, Phil Webb’s first talk high-lighted the parallets between Moses and Jesus. Then several groups set out with hammers, nails and waymarkers to walk the Via Beata path around Steve and Gill Eggleton’s home in Banham. 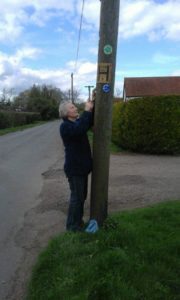 Lorie Lain-Rogers fixes a waymarker on Ash Lane, Carleton Fen. It was a useful exercise as it transpired that one or two footpaths had disappeared since the route guide was written three years ago. Amendments can now be made where necessary. After a tasty meal cooked by Gill and her team, Steve shared an overview of the year. 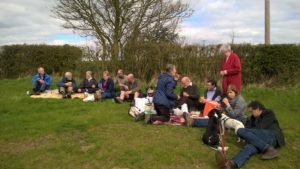 The route has now been finalised to Little Gidding, and Biddy has walked a prospective path with Nigel Sykes across Northamptonshire. Following this, Phil gave his second talk dealing with some of the discouragements that Moses had had to cope with. We had a very blessed time at The Grace Fellowship, Little Stukeley on Sunday morning. Phil spoke about faith, and how despite all the amazing things that Moses did, the faith chapter in Hebrews speaks of two things regarding him. One is that he was prepared to identify with the Lord’s people rather than enjoy a life of luxury in Egypt, and secondly that his parents acted by faith in hiding him as a baby, despite the risks, because they could see that he was a special child. looking out over the wonderful rolling farmland of the area. There followed a walk, ending at Little Gidding, where we are due to place another way-station later this year. We met for tea and cake in the tea-room, where Phil gave his final talk based on Psalm 90, which is a psalm of Moses.